The Lunar New Year I LOVE YOU, YOU'RE PERFECT, NOW CHANGE! (NEI MAI LEI, NGOR OI NEI!) two nights ago held a charity premiere. Wong Cho Lam, Teresa Mo Shun Kwan, Timmy Hung Tin Ming, Korean star Melody Park So-yeon attended. Returning to Korea soon, Park So-yeon even greeted everyone Happy New Year in advance and gave away lai see. 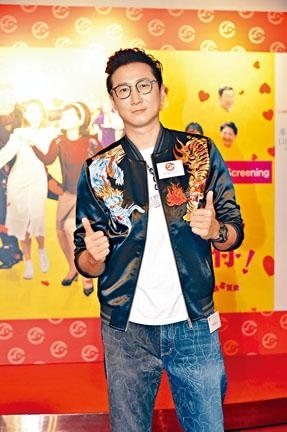 Cho Lam revealed that he went undercover to cinemas in various districts to see reactions and was happy to the enthusiastic response. In particular women liked to watch Mo Shun Kwan's acting. He even suggested that Sister Mo would be able to challenge Best Actress in the musical role for the first time. As for the film's official release, director Wong Cho Lam admitted that he was very nervous. He went undercover morning, noon and night to cinemas at various districts to see the reaction. "After seeing the overwhelming response I immediately had confidence. Actually Hong Kong people can accept Cantonese musicals. Viewers praised the movie as very cute, ladies especially liked to watch Mo Shun Kwan act. They praised her as funny and touching." Did Sister Mo caught attention because of her 50F bust in the film? Cho Lam said, "Men of course look at figures, women watch acting." Sister Mo said that her family already saw the film at the premiere and said that no matter what role she played her daughter would praised it as great. Her husband was known for being picky, but he praised the performance of one scene as decent. Cho Lam even suggested for Sister Mo to challenge Best Actress with her first musical character. "I feel Sister Mo can blaze the trail, many said to me that they saw joy, anger, sorrow and happiness on her. Her acting completely had dimensions, she even had to sing and dance." Sister Mo dared not think much about challenging for Best Actress. Instead she would rather have a raise. Because she and Cho Lam often would meet and chat, she would not eliminate the opportunity of working together again. In addition, Cho Lam's wife Leanne Li Yanan earlier said that she did not want to have another baby. He denied that. "She isn't going to stop, she just wants to wait for recovery. After a year she will be able to. She likes children very much herself." Timmy Hung Tin Ming said that Papa Sammo Hung Kam Bo has always wanted a granddaughter, as he has been rushing him since before his older son was born. Tin Ming said, "Of course having a daughter would be good, but now having two children is already very tough. Because I am often not in Hong Kong, the scheduling is pretty tough. I don't know to neglect her after her birth, I also have to see if the Old Lady want to have another." Tin Ming hoped that his brothers would get married soon and lighten his burden. He also said that he would consider using advanced technology to have a daughter. "Now technology is so advanced that the gender can be chosen. A friend got a surrogate mother overseas, but the Old Lady worried about the surrogate mother's diet and health. In addition legally Hong Kong still has not accepted surrogate birth, so I have to see if the Old Lady would be willing or not. If healthy and she can take it then we might try again in a year or two."